The honey bee immigrated from Europe, so I guess we shouldn’t be surprised that a bee-eating hornet made its way over as well. Wasps and hornets in general make me nervous, and the European hornet (Vespa crabro) is big enough to be scary. We had a rather large European hornet around in the spring, possibly a queen, and one day I watched her steal a bee from my top bar hive and fly off. I haven’t seen any in a while, but this past weekend one appeared four or five times around the hives. I’m guessing this is a worker or workers that have see my bees as a nice little snack, perhaps even easy pickings, but it did indeed freak me out a little every time I saw it. As I was preparing to inspect Jupiter that Sunday, one of these hornets came by and landed on the side of the hive. I had my gloves on, and boldly and bravely slapped it against the box. It fell the grass, probably stunned, and I scrunched it into the ground with my boot. We’ll see if any more show up this coming weekend. While preparing for this post, I read that these hornets rarely sting and are generally beneficial (they eat a number of garden pests). Fear of them has led to destruction of their nests, and they are an endangered species in some countries. It is apparently illegal to kill them in Germany, for example. They still freak me out. This concept seems rather self-explanatory. I have really enjoyed our top bar hive (TBH) this year. I’m sure the disposition of the bees has something to do with it, as these Italians from California have been well behaved. It is amazing to watch new comb appear out of thin air from a simple wooden bar. Truly a wonder. 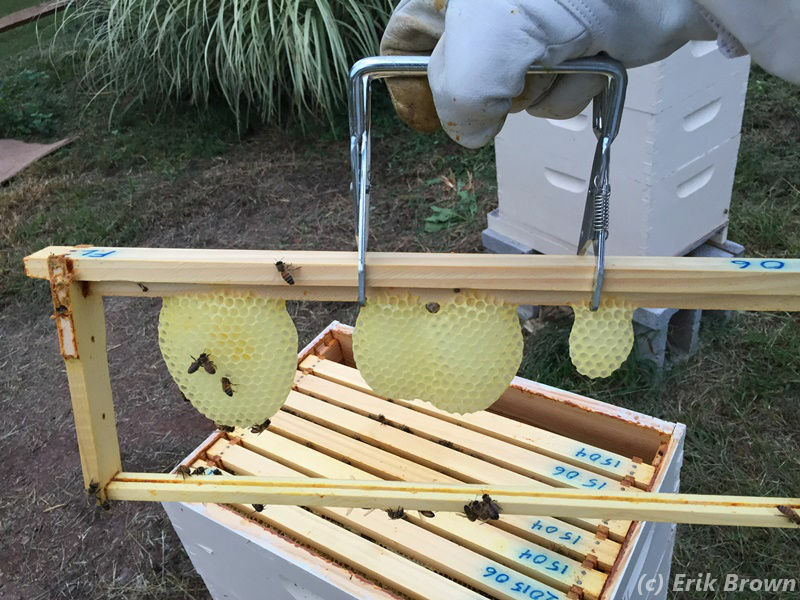 The ability to inspect a comb without disturbing the rest of the hive is nice, not to mention the lack of cost for frames and foundation. I am contemplating building a new TBH before next spring. I like the idea of longer top bars to match the Langstroth frame width. The bars could be used in a Langstroth box in a pinch, or a Langstroth comb could be cut to the top bar size more easily than my current bar size. My current top bars are 14 inches, with the comb area roughly the same as a medium frame (where comb is roughly 17 by 5 inches). A larger top bar around 19 inches (the width of a Langstroth frame) can create a comb size the area of a deep frame (where comb is 17 by 8 inches). While the bars would be heavier, there would be more storage area per foot; and the bees would have a larger and deeper area to huddle in during the cold winter nights. Just thinking about it right now. Not sure how I would transfer or otherwise handle the bees from my current TBH. With a few months to think about it, we’ll see what I decide. Mars on September 25, 2015, with a single deep and two medium boxes. The smaller box beneath the top cover is a feeder for sugar syrup. 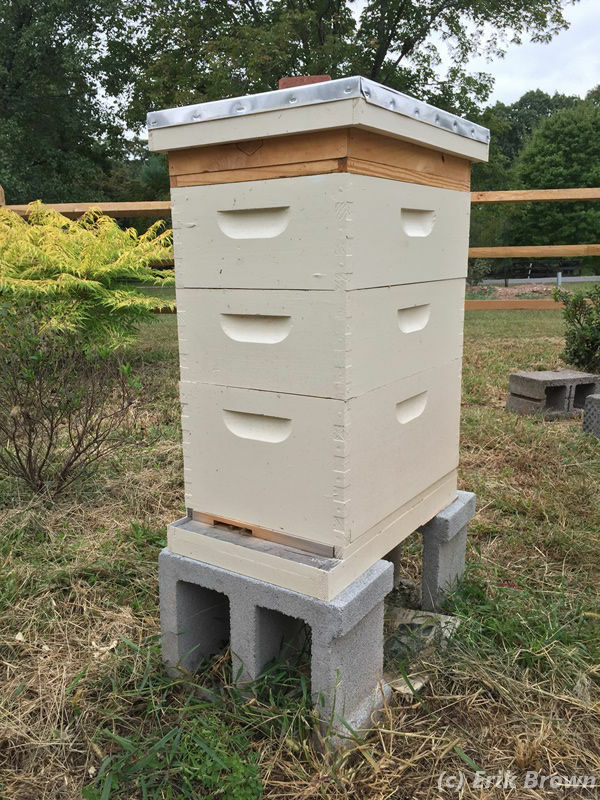 Our Russian bees came in nucs full of deep frames, so my Langstroth hives have one deep box (about 10 inches high) with medium boxes on top (about 6 inches high). 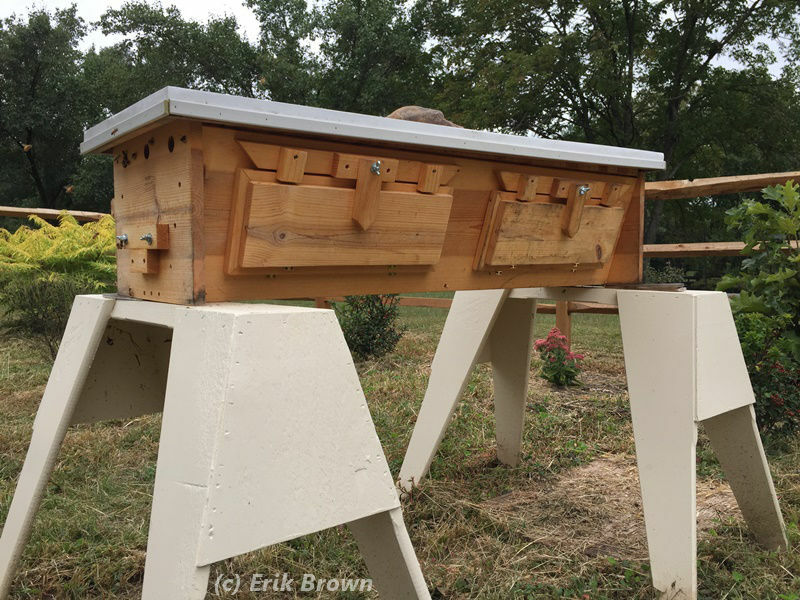 A couple times this year it would have been nice to exchange frames between the first and second boxes to encourage the bees to extend the brood nest or build out a frame. This is not possible when the two boxes are different sizes. So I see why some beekeepers use only one size box. 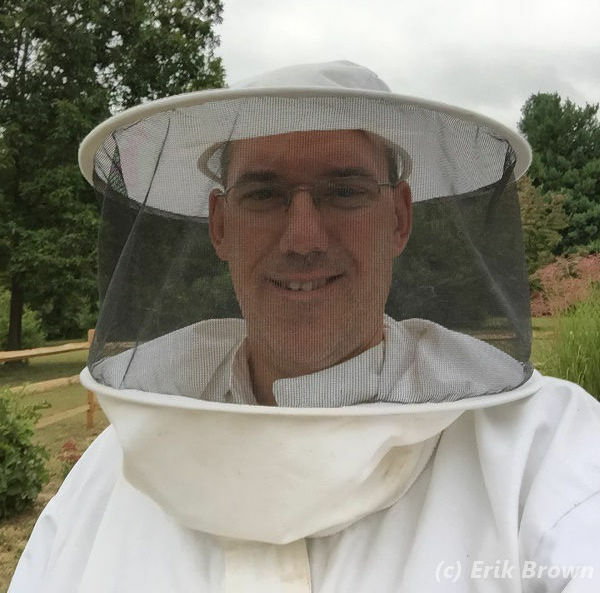 If the bees are healthy in the spring, I may try to split both hives to create a single-deep hive and a medium hive. I could then sell or otherwise give away the single deep to standardize on a single box size. I know this would set me back a bit, as the deep box right now is the preponderance of each hive. Still, if I’m going to standardize on mediums, may as well switch sooner rather than later. Again, I have a few months to think about it. Two deep boxes is nearly the size of three medium boxes, so inspections could take longer with only medium boxes and the cost is likely more expensive. Another advantage of top bar hives, I suppose, as these questions don’t even arise. It seems quite easy to worry about the hives. Do they have a queen? Are there enough stores for winter? Is the entrance too big? While problems will surely arise, the bees seem to handle my worries fairly well. One hive did need a new queen this year, but the other superseded (replaced) theirs and did just fine. Recently I’ve seen darker bees around the top bar hive. It might just be drifting from the two Russian Langs, but I am fairly certain they used to be more uniformly lighter in color. So perhaps the bees superseded the queen. I can never find the queen when I do an inspection, so I may never know. My most recent occurrence of bees being bees is with foundationless frames. You may recall that I ran out of foundation and inserted a few empty frames into both Lang,s to fill up the boxes. One hive has a deep and two mediums, the other a deep and one medium. I asked local Russian breeder Chris Hewitt about this and he assured me that his bees winter well on a single deep and one medium. 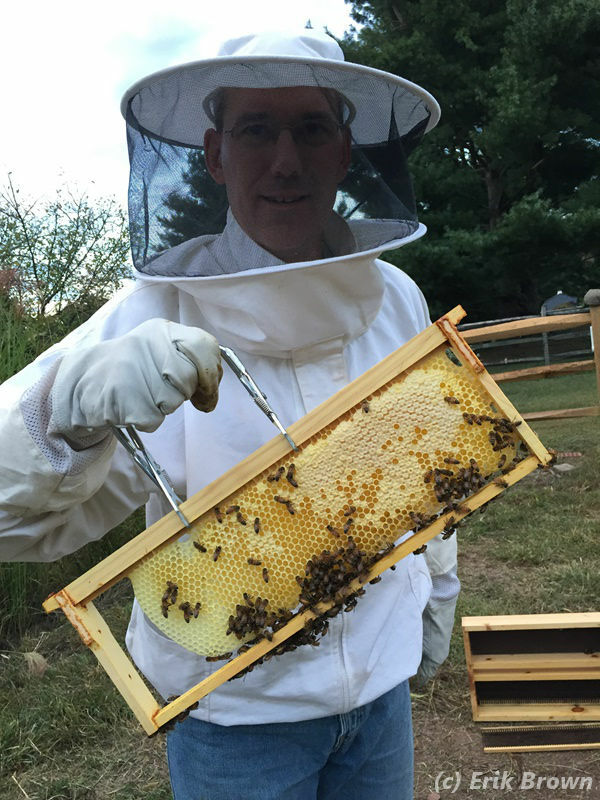 However, I am running 8-frame hives so I assume they should be fairly full. 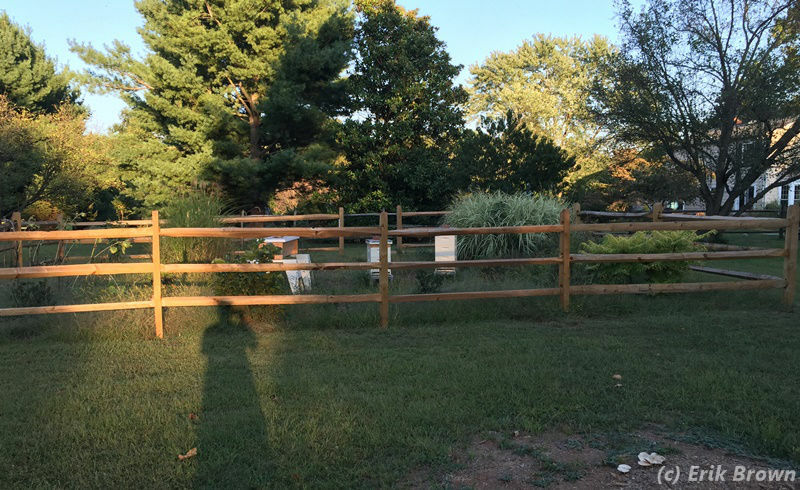 I was able to check these two hives last week, and both had built out their foundationless frames. This is all the more amazing since the local beekeepers assure me there is little or no nectar flow in the fall. I have fed them some syrup but not enough to both build and fill these frames. So they must be finding something somewhere. Aside from the relatively well-known 1971 book by Ram Dass, Be Here Now is a phrase I’ve used a lot lately as part of a culture shaping effort at work. It conveys the idea of being fully present in what you are doing, whether talking on the phone, attending a meeting, or other activities. Be Here Now is about giving your full attention to your family, really listening to your employees and customers, and otherwise focusing on the topic at hand rather than splitting your attention with a phone or other distraction. It seems to apply quite well to beekeeping, as if you go into the bee yard distracted and thinking of other things the bees may well notice. Do you have ivy nearby? That’s providing a nectar flow in London at the moment. I wouldn’t worry about the European hornet. They may take a few bees, but are nothing like the problem the Asian hornet is. I don’t think we have ivy that blooms this time of year. We have goldenrod and other fall plants that don’t always produce nectar. Yes, I’m very glad we don’t have Asian hornets here.